Ultimately the money to pay your medical bills will come from the insurance company of the driver who caused the accident. This is a question we receive frequently and it’s confusing. Many clients believe that if they didn’t cause the accident, then they should not be responsible for their medical bills. Certainly, that makes some sense. However, when a person seeks medical treatment from a hospital or doctor or chiropractor, the bill for that treatment is between the patient and the provider. The good news is that the total amount of your medical bills is a driving factor in determining what your case is worth. In other words the amount of your settlement is in part determined on the amount of your medical bills. There are other factors too, including the severity of the accident, lost wages, disfigurement, or the loss of normal life activities. How Do I Get the Money to Pay My Medical Bills? So if you are financially responsible for your medical bills, how do you obtain the money to pay those bills? First, you should always submit your medical bills to your health insurance or medical card. If your health insurance pays for your medical bills, a subrogation claim is created. This means when you receive a settlement, a portion of your settlement will be needed to pay back that subrogation claim. Second, you can submit your bills to your medical payments coverage. Most drivers have medical payments coverage on their automobile insurance. 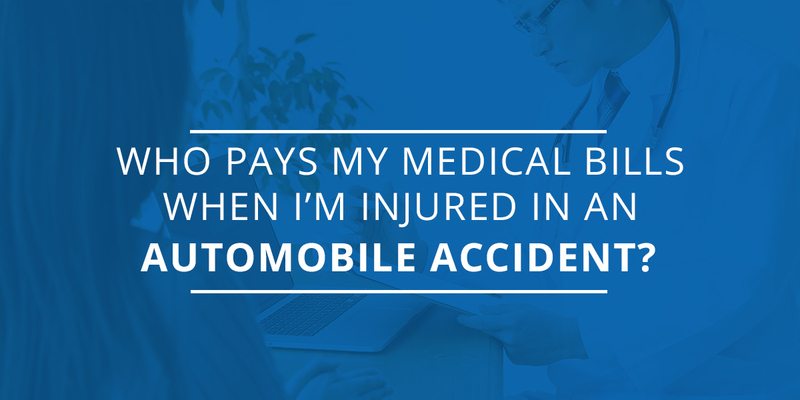 This coverage provides payment for medical bills regardless of who was at fault for the accident. If you do not have medical payments coverage, you absolutely should. Third, you can self-pay and seek reimbursement through the settlement proceeds. As you can see, this is a complex issue. If you’ve been involved in an accident, you should seek legal help right away. Schierer & Ritchie, LLC helps people who are injured in an automobile accident. We can review your case for free and we never received a fee unless you recover money for your injuries. Call us today at 1-309-839-2024 for a free consultation.